Sean Dyche hopes technical director Mike Rigg’s influence will improve Burnley in the coming transfer windows. But Dyche explained that Rigg, who has been technical director with the FA of Wales, Blackburn Rovers’ chief scout, head of player acquisition at Manchester City, technical director at QPR, head of talent identification at the Football Association, and chief footballing officer at Fulham, was brought in for a longer-term view, saying: “We want to add layers to it and get more depth into our recruitment. That’s one of the key things. The model of recruitment, the depth, the knowledge, the increase in how we can work in order to get the next level of player that we need. But, the pressure is now on, with the club having fallen two or three signings short in the summer, and then only being able to add Peter Crouch, while allowing Sam Vokes to leave, in January. Dyche hopes Rigg can add vital knowledge moving forward to enable the club to mine different markets to make their money go further: “We are looking for continued progress. We have done well I feel with player trading and with making a team that can be successful and it is now about adding the next level to that. “Can we add more detailed analysis, more detail in our financial planning regards players, are there high quality younger players we can bring in, can we open our minds to the foreign market in a more deep level. We have been but can we get that depth to the players that we are looking at. “It is all of those things that are a continued part of the growth. It is something we have been fighting for for a long time, I felt it has been really necessary here for a long, long time but Burnley takes time. 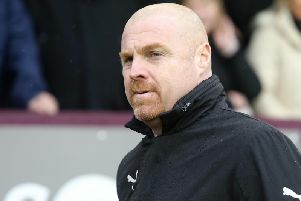 Dyche and Rigg have had time to get to know each other’s ideas on potential targets, and he added: “Just getting an alignment on what I think of players and what he thinks of players. And not just players but the planning, the team, the recruitment, the analysis side, all the various things.